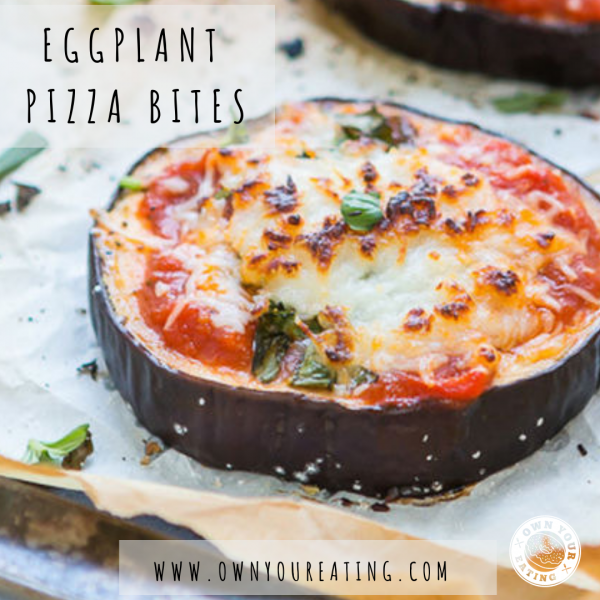 Here's a low-carb snack that will easily satisfy your hankering for pizza! Made with just 6 ingredients, these eggplant pizza bites only take 10 minutes to prep and roughly 30 minutes to cook. Preheat oven to 400 degrees F. Line your baking tray with parchment paper and spray with non-stick cooking spray. Chop the eggplant into 1/4 inch thick slices. Sprinkle with the corse salt and allow to sit on paper towels for 10-15 minutes. Remove the salt and pat dry. In a small bowl, combine the crushed garlic and Italian seasoning. Lightly brush each side with a small amount of olive oil and press into the mixture of garlic and seasoning so each side is lightly covered. Arrange your eggplant on the baking sheet. Bake the eggplant for 15 minutes, remove from the oven and flip the eggplant over on to the other side. Add a tablespoon of marinara and a sprinkle of mozzarella cheese to each slice. Return to the oven and bake for another 10-15 minutes, or until cheese is fully melted and golden.